Honestly, these titles get worse don’t they, still at least it announces, to those who have had the dubious privilege of reading my recent communications that we’ve moved on from Doe Park in Teesdale down the A1 a bit to Yorkshire. 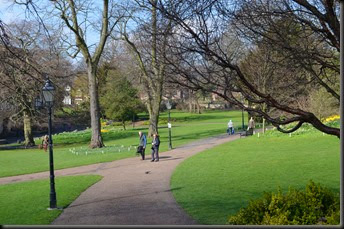 Or, more precisely, York. We’ve enjoyed it very much but once again, time has beaten us, as we move on again tomorrow, down to Rutland for the second ever ‘Twittercamp’. It’s been fun, and here’s what we’ve been up to. Our last night in Doe Park, saw us dining out at the the pub we had visited previously, the excellent Crown at Mickleton. The beer was good, the food was better and the deserts were divine. We left, lighter in the wallet and heavier in the stomach but well sated. It was another short hop down to York so there was no rush to get away, with earliest check in on site not being until midday. Nevertheless, before 10am we were on the road and heading south. I drove the first leg, and with the wind a lot lighter our new tug Rosie performed much better. We paused at the services for a bacon bap and coffee, stretched our legs and then Trev took over for the final run in to York. We timed it almost to perfection, arriving at the site just before midday. However we weren’t alone. There was a queue both in front and behind of other campers clearly of a similar mind. The wardens waved us in. What followed next was a military operation, with the wardens arranging the new arrivals in two lines, the driver staying with the car while other halves go in and pay. Despite the large volume of caravans and motorhomes the whole operation went smoothly – as – one of the wardens told us – it usually does, as it’s always like this on a Sunday. Well done to them. By 12:30pm we were sited, with the legs down and the kettle on. Again, no awning. We didn’t want to waste what little time we had with unnecessary er, erections….. The site is functional, rather than pretty, it being on the banks of the River Ouse and centrally located next to Rowntree Park and just a short walk in to the city centre. The whole facilities block, including reception is raised to prevent flooding. It’s compact and even those experienced in reversing might welcome a motor mover. A gate at the back of the site offers a shortcut to the local shops and a few pubs. Sunday afternoon we had our first look at York to get our bearings, but with frequent outbursts of rain spent more time dodging in and out of shops. A couple of the aforementioned local pubs were the no doubt grateful recipients of the patronage of the Blogger in Black and his Portly Partner. I.e, me and Trev. 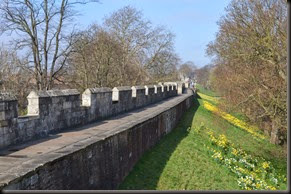 The weather was much better on Monday and we were back in the city after traversing the western sections of the city walls. 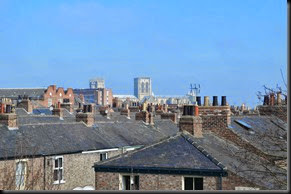 There are some great views to be had and the Minster is rarely out of sight. 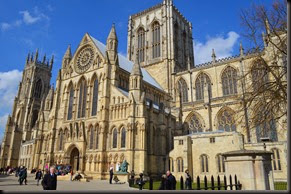 We checked out the museum gardens then ambled around the town for a while enjoying the relaxed ambience – a large part is pedestrianised – before heading to the Minster. Well, the place itself is stunning, but we couldn’t help comparing it to Canterbury cathedral, which we visited about 18 months ago. We took advantage of a guided tour – included in the admission fee – and glad we did. We saw things we’d have never have seen if we just dawdled about aimlessly, like we usually do! 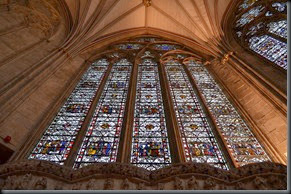 Our guides particular interest seemed to be in the stained glass windows and pointed out things we’d have never have spotted otherwise. The tour takes and hour and run every half an hour or so. Your ticket is valid for a year, so if you have time – come back and get another perspective from a different guide. A late lunch was taken at a well known pie and sarnie chain and we attempted to walk it off but our feet had clearly had enough. We headed back observing that a temporary caravan site appeared to have materialised in the coach park on the other side of the Ouse, occupied as it was with a number of large twin axle caravans and accompanying white Ford Transits. The weather forecasters had proved themselves right again as we woke to showers on Tuesday morning. They said the showers would be around all day and who were we to disbelieve them? 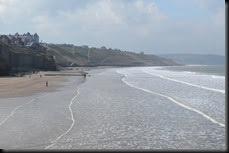 What they also said was that the coast – only 50 or so miles away would be blessed with sunshine most of the day. So we fired up the waiting Rosie and headed off. 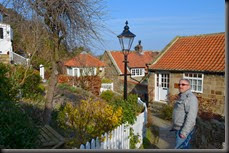 Now, we’d been to Whitby before – some seven years ago, but were both glad to go back. Having parked up on the marina we headed first across the harbour bridge to the eastern side, availing ourselves of a late breakfast before crossing back to the west. 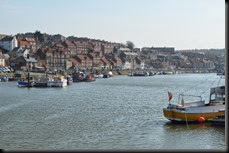 Whitby is famous for a couple of things – well probably more but I can only think of two at the minute. The first is fish – people come from miles around for the excellent range and quality of fish that’s brought ashore here. Queues outside chippys and fish restaurants are not uncommon. The second is Dracula. Yes, in Bram Stokers book of the same name it was here that the caped count (careful how you say that) came ashore before reeking havoc. 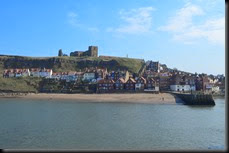 As a result Whitby has become abut of a cult place for Goths and the like, so much so that the twice yearly Goth (& Alternative) Weekend festivals are now in their twentieth year. There was very little evidence of our black clad friends though (apart from me I guess), maybe something to do with it being daylight. 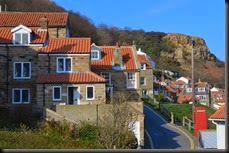 We were planning to head off to Robin Hood Bay but, having popped into a barbers for a haircut was recommended instead to check out a little place called Runswick in the opposite direction. I’m glad we took her advice too because it was beautiful. 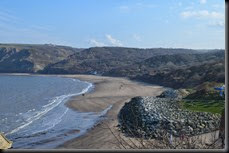 A large shallow beach with houses perched on the hillside, it was clearly very photogenic and we duly obliged. 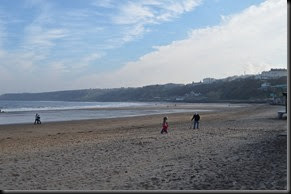 We bypassed Robin Hood bay – having been before – and headed instead to Scarborough where the late afternoon sun was disappearing and the temperature plummeting with it. A lot quieter, tourist wise than Whitby, but pleasant enough nonetheless. We came across an interesting and rather large sculpture of a certain Freddie Gilroy. An ordinary man who had an extraordinary life like many who survived the worst atrocities of the second world war, the sculpture was originally on loan to the town for just four weeks, but a very generous lady by the name of Maureen Robinson bought the sculpture for the town and Freddie is now a permanent fixture on the North Beach. 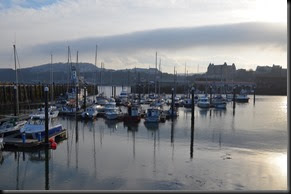 All in all a great day out, the journey up to Whitby gives you the chance to experience the stark beauty of the North Yorkshire Moors and the a great town awaits you on the coast. Right, almost there. Wednesday and our last full day here in York. The plan was to head out to Knaresborough & Harrogate before coming back to do the National Railway Museum in town. There was shopping to do as well, (and a blog) and the need to get ready for our departure tomorrow. 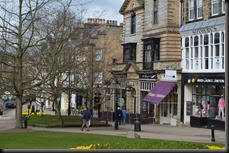 Our next stop is Rutland, for Twittercamp, and we wanted to be well organised. 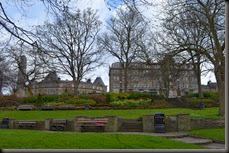 Well, we got to Harrogate, eventually, but roadwork’s slowed us down so with time marching on it was only a short visit. Knaresborough got an even shorter one and coming back we decided to forego the railway museum for another time. Trev had never been and whilst I’d been around it a couple of times it was over twenty years ago. So, there we are. up to date again. Another great area, and yet again not enough time. 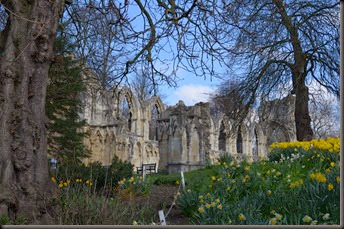 The moors deserve more exploration as does York itself, and we didn’t even get over to Yorkshire’s cities to the west. There’s always another time though and hopefully it will be sooner rather than later.